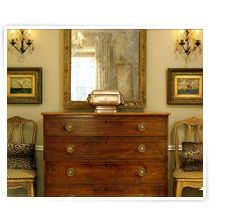 Charlotte Herndon Cahoon founded the residential design firm Herndon Interiors, LTD,. in 1993 after working for such prestigious firms as Sotheby's, Cowtan and Tout, and Pauline Boardman Ltd. Her interest in design was sparked during college years spent in Europe studying art history and architecture. Her continued education includes Sotheby's four-month intensive study of 17th and 18th century Decorative Arts in London and courses at the New York School of Interior Design and the George Read Charleston Antiques School. Charlotte's distinctive style, while classic and refined, reflects original thought and a fresh spirit derived from her extensive travel abroad and her design work in such diverse cities as San Francisco and New York. Her sophisticated taste is exemplified in the diversity of her portfolio, which includes Fifth Avenue penthouses, a Napa Valley ranch, a Thomasville plantation, a Sea Island retreat, The Croquet Cottages and other homes at the Chattooga Club in Cashiers, as well as many primary residences in Atlanta's Buckhead. She recently appeared on HGTV's "Homes Across America" featuring the Massey-Mitchner House, a recipient of the Georgia Trust's "2003 Preservation Award for Excellence in Rehabilitation:. All of Charlotte's projects exhibit her exceptional ability to artfully combine all of the key elements of a successful room. Her rooms reflect a rare talent for creating an interior that marries luxury and elegance with originality and comfort, while keeping the client's individual taste and specific needs in the forefront.